The victory came in his 25th start and it came in conditions that shifted back and forth between torrential rain and overcast but dry. Also soaked after the race were Marks’ eyes as he fought his emotions in talking about the win. Hornish, who started from the pole but spent considerable time in trackside grass and gravel pits, finished second while Ryan Blaney was third. “It was a wild race from the drop of the green flag,” Hornish said. “Our Rheem Chevrolet was right where we needed it to be for dry conditions. When it’s that good in the dry, you know it’s probably not going to be as good in the rain. We kept it on the track when it counted. I got off there a little bit on the first restart in the rain. Ty Dillon finished fourth while Justin Allgaier was fifth. 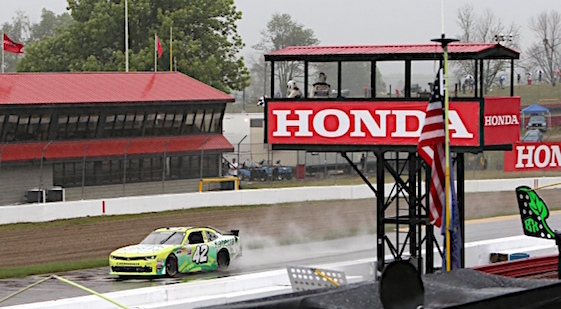 The race was a bizarre spin-fest as the water logged track had a clear advantage over drivers not used to running road races let alone road races in pouring rain, and over the treaded tires which the cars used both early and late. In between cloud bursts, the rain stopped and teams went to slicks as the track dried. But with 22 laps to go, the rain began to fall again and most the field pitted under yellow to put wet tires back on the cars. Not pitting and taking the lead was Owen Kelly in the No. 18 Joe Gibbs Racing entry. Blaney was first out of the pits and restarted from P1 with 20 laps to go. On the restart laps large numbers of cars began spinning off the track. Among those was Blaney’s and a couple of others’ who were running in the top five. Out came the caution. Taking the lead was Bubba Wallace with Allgaier second and Andy Lally third. After the restart, which came with 14 laps to go, Wallace began to pull away. But with 13 to go, Wallace flew off the track. Taking the lead was Dillon. On his rear bumper was Marks. With 10 laps to go, Dillon drove into the grass and Marks had the lead. Once in the lead, Marks kept his car on the track – something few others were doing late in the race – built on his lead and with five to go was 17 seconds ahead of second-place Dillon. A lap later, the yellow flag waved and Marks’ gap was erased. On the restart, which came with two laps to go, Marks got away cleanly while Dillon lost traction and was passed by Hornish and Blaney. When he took the checkered flag, he was 3.7 seconds ahead of Hornish. (16) Justin Marks, Chevrolet, 75. (1) Sam Hornish Jr, Chevrolet, 75. (3) Ryan Blaney(i), Ford, 75. (7) Ty Dillon, Chevrolet, 75. (11) Justin Allgaier, Chevrolet, 75. (6) Erik Jones #, Toyota, 75. (15) Andy Lally, Chevrolet, 75. (12) Brendan Gaughan, Chevrolet, 75. (4) Elliott Sadler, Chevrolet, 75. (17) Brennan Poole #, Chevrolet, 75. (8) Ryan Reed, Ford, 75. (13) Blake Koch, Chevrolet, 75. (22) Alon Day, Dodge, 75. (21) Ross Chastain, Chevrolet, 75. (10) Darrell Wallace Jr, Ford, 75. (2) Owen Kelly, Toyota, 75. (24) Ryan Preece #, Chevrolet, 75. (29) Ryan Ellis, Chevrolet, 75. (19) Brandon Jones #, Chevrolet, 75. (27) Stanton Barrett, Ford, 75. (26) Dakoda Armstrong, Toyota, 74. (23) Ryan Sieg, Chevrolet, 74. (5) Daniel Suarez, Toyota, 74. (36) Garrett Smithley #, Chevrolet, 73. (32) David Starr, Chevrolet, 73. (30) Mike Bliss(i), Toyota, 73. (38) BJ McLeod #, Ford, 73. (37) Joey Gase, Chevrolet, 73. (31) Timmy Hill(i), Chevrolet, 72. (33) Ray Black Jr #, Chevrolet, 72. (35) Jordan Anderson(i), Chevrolet, 72. (28) TJ Bell, Chevrolet, 71. (39) Roger Reuse, Dodge, 70. (14) Jeremy Clements, Chevrolet, 64. (20) JJ Yeley, Toyota, Accident, 56. (18) Kenny Habul, Chevrolet, Accident, 54. (34) Tim Cowen, Ford, Accident, 54. (9) Nelson Piquet Jr, Ford, Accident, 31. (40) Mario Gosselin, Chevrolet, Electrical, 3. (25) Jeff Green, Toyota, Rear Gear, 2. Average Speed of Race Winner: 53.437 mph. Time of Race: 03 Hrs, 10 Mins, 09 Secs. Margin of Victory: 3.707 Seconds. Lap Leaders: S. Hornish Jr 1-4; R. Chastain 5; S. Hornish Jr 6-8; O. Kelly 9; S. Hornish Jr 10; J. Marks 11-42; A. Lally 43-45; T. Dillon 46-47; R. Blaney(i) 48-53; O. Kelly 54; J. Marks 55; D. Wallace Jr 56-62; T. Dillon 63-65; J. Marks 66-75. Leaders Summary (Driver, Times Lead, Laps Led): J. Marks 3 times for 43 laps; S. Hornish Jr 3 times for 8 laps; D. Wallace Jr 1 time for 7 laps; R. Blaney(i) 1 time for 6 laps; T. Dillon 2 times for 5 laps; A. Lally 1 time for 3 laps; O. Kelly 2 times for 2 laps; R. Chastain 1 time for 1 lap. Top 10 in Points: E. Sadler – 700; D. Suarez – 675; T. Dillon – 667; E. Jones # – 648; J. Allgaier – 646; B. Gaughan – 631; B. Poole # – 618; B. Jones # – 595; D. Wallace Jr – 539; R. Reed – 526.